What kind of shows and events do you do? We do many types of public and private events: fundraisers, opening nights, galas, silent auctions, fireworks festivals, outdoor street festivals, small functions, weddings, school visit, private workshops, television segments, etc. We are available to do any type of event! How many shows do you do every year? We usually perform an average of 15 shows per year (between 12-18 over the last few years), not including the workshops we hold throughout the year. Visit our Performances page to view a comprehensive list of all of our past performances. Our performances range from 5 minutes up to 30 minutes or more. We can also do multiple sets at a single, long event. For example, we performed three 30-minute shows at Canada Day in Cochrane in 2015. Yes. We are incorporated as a non-profit Society in Alberta under the name “Midnight Taiko Association” as of October 2016. How do I book Midnight Taiko for an event? You can contact our booking agent at bookings@midnight-taiko.ca or visit our contact page for more contact information. If we are not booked on your requested date, the booking agent will gather some information about your event. They will then provide all of the members with the information and ask for their availability. Only when the fee has been negotiated and the minimum number of members are committed will we confirm the booking. What size of space do you need to perform? Depending on the number of drummers we have for your event, we require a space of at least 12′ deep by 12′-15′ wide. However, we are able to handle most stage requests by adapting our drum positioning depending on the venue space. The fee will be determined by the booking agent after all the of the event requirements are assessed. Do you perform at events outside of Calgary? Yes, we do. However, we will charge for additional expenses if significant travel is involved. 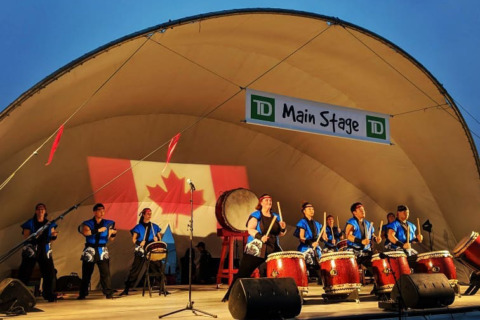 If the event is in the Northern Alberta region, there are two Taiko groups in Edmonton who may be able to handle your request. There is also a group in Lethbridge for any requests in the Southern Alberta region, south of Calgary. Can you come and do a free, 5-minute show? Unfortunately, due to the significant logistical challenges of transporting the drums as well as the time commitment for each member to rehearse and take time off during the day of the event, we do not do free, 5-minute performances. We practice for 2.5 hours, approximately 2-3 times a week. Sometimes we hold additional practices if we are rehearsing for multiple shows in a short timespan. We mainly practice at the Calgary Nikkei Cultural & Senior Centre, but we also practice at Ben’s Aikido dojo occasionally. Do you have drop-in classes? Yes, we do! We are now offering TAIKO HOUR to give the public a fun, relaxed way to experience Taiko drumming. Visit our TAIKO HOUR page for dates, times, and registration. 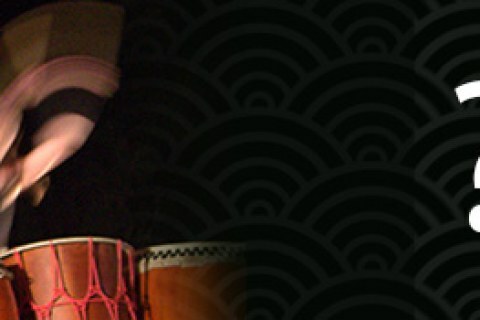 You can also visit our workshops page to see we are currently offering for a more comprehensive Taiko drumming class. If you are a Taiko drummer from another group and would like to come visit a practice, please contact us ahead of time to arrange an available date and time. Are you professional Taiko drummers? No. As we are a community group, each member volunteers their time to practice and perform with the group. All of the funds earned from performances goes back into the group to purchase equipment and other expenses. How do I join Midnight Taiko? To become a member of Midnight Taiko you must successfully complete the Apprenticeship training. To be considered for Apprenticeship, you must have completed our Beginner and/or Intermediate Taiko workshops or an equivalent Taiko workshop with another Taiko group. The Apprenticeship period is a time where you will practice and train with the members of Midnight Taiko to gain a strong foundation in Taiko drumming and learn the group’s repertoire. This is a formalized period with certain guidelines and expectations, and specific time set aside for learning and training. Apprentices must complete a combined 50 practices and shows – which is approximately 8-10 months – before being considered for Performing Member. What is expected of an Apprentice? There are many factors that allow an Apprentice to become a full member, but the main values we look for are: teachability, attitude, commitment, and passion. As we are kumi-daiko – or group Taiko – the group dynamic, relationships, and attitudes of each member is of vital importance and translates directly to our success and presence on stage. We ask that anyone interested in becoming an Apprentice be willing to commit their time, practice constant self-improvement, contribute to the group where they can, and simply take joy in drumming.